Should you want to actively participate in the discussion, contact us via email at registration [at] kamailio.org in order to plan a bit the structure. Last minute joining is also possible, but a matter of capacity for the video conferencing system.Thank you for flying Kamailio! Along the past 15 years, Kamailio-SER participated at many of the SIPit events, which is reflected in the robustness of the application. This edition, at least Olle will be again there to ensure the latest version stays rock solid.Many of the automatic tests on site are built using Kamailio, go there and hammer it!Thank you for flying Kamailio! The ClueCon 2016 is preparing to start next week in Chicago, IL, USA. Organized mainly by the FreeSwitch developers, the event brings together VoIP enthusiasts from around the world.Many Kamailio friends and community members will be at the event, be sure it worth attending it.Our Fred Posner, from Palner Group/LOD Communications, will present about pairing Kamailio and FreeSwitch to build scalable and secure VoIP systems.The friends at Asterisk PBX project are represented by Matthew Fredrickson of Digium, touching in his presentation the use of Asterisk and Kamailio to enhance SIP presence services.Karl Anderson of 2600hz, which were contributing lately a lot of code to Kamailio’s presence and database extensions, will talk about their open source Kazoo Cloud PBX platform.We spotted some of the big supporters of Kamailio World Conference, respectively Simon Woodhead from Simwood eSMS, Matthew Hodgson from Matrix.org, Mira Georgieva from Zoiper, as well as long time Kamailio friends or developers such as Alexandr Dubovikov from Homer Sipcapture, Emil Ivov from Jitsi/Atlassian, Cezary Siwek, Giovanni Maruzelli, Michael Ricordeau and Tristian Foureur from Plivo.Wishing everyone great season holidays!Thank you for flying Kamailio! The 96th meeting of IETF (the Internet Engineering Task Force) takes place in Berlin, Germany, during July 17-22, 2016. 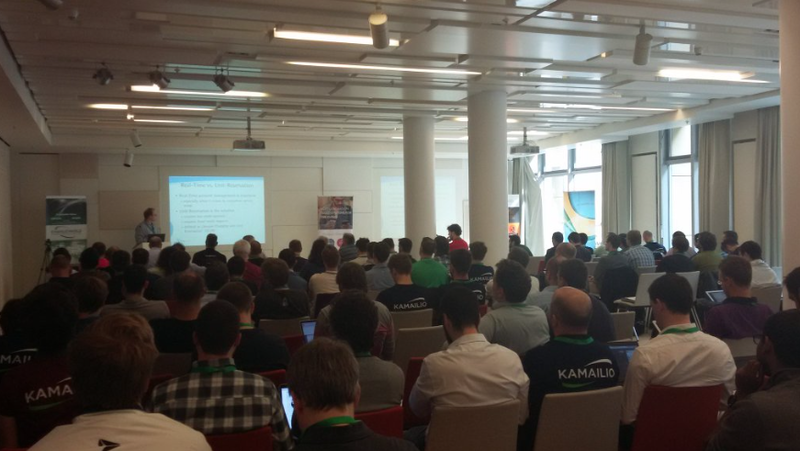 Ahackaton tied to the IETF meeting is organized during the weekend, July 16-17 .Among the major standardization topics to be discussed, from Kamailio point of view, are: SIP, WebRTC, TURN, IPv6, TLS and DNS (DNSEC/DANE).Daniel-Constantin Mierla and Olle E. Johansson from the Kamailio community will be present at the event.Together with Lorenzo Miniero from Janus WebRTC Gateway project, they plan to organize a meetup (for drinks/dinner) on Monday evening, July 18 — likely to happen at a restaurant nearby IETF meeting, starting around 20:00. If you are in Berlin and want to join, contact us (email to sr-users mailing list or contact directly one of these three persons). Each participant will take care of own expenses, we aim to have an open discussion about what’s new lately and where we head on in real time communications space.Looking forward to meeting some of you next week in Berlin!Thanks for flying Kamailio! Important: this version marks the end of planned releases from branch 4.2. From now on the focus is on maintaining the branches 4.4 and 4.3 for stable releases.Thank you for flying Kamailio! Enjoy the summer holidays! Update 1: some of the maintenance work will be performed in the afternoon of Monday, June 6, starting with 14:00 Berlin, Germany.In the near future, likely next week, kamailio.org server will receive a maintenance upgrade. The exact date will be decided soon and announced on Kamailio mailing lists and other online channels.Main affected services: website (including the wiki portal) and mailing lists.Hopefully there will only be short downtime intervals. Anyhow, if it happens that you are trying to access kamailio.org and it is not responding, retry a bit later.The #kamailio IRC channel on freenode.net server can be used for discussions during the upgrade interval. Time is passing fast, no doubt, feels like yesterday when we were toying with the idea of organizing a Kamailio related conference and now we are one week before its 4th edition.Every year there was an increase in the number of the attendees and we are going to run full house this edition. Of course, we take this chance to celebrate 15 years of development for Kamailio, a long journey, not always smooth, but everything ended up strengthening the project. Being the oldest very active developer, I (Daniel-Constantin Mierla) can say that Kamailio has one of the most active, challenging and pleasant to work with community, including here all the developers and users, this being the main reason of getting to where we are now with the project. Many thanks to all of you for that!Back to the next week, some last minutes updates. The exhibitors are preparing again very interesting product or services show cases and demos for the entire duration of the conference days. Expect some local 4G/VoLTEinfrastructure from NG Voice and Core Network Dynamics. Matrix.org returns this year with an integration between SIP and the matrix federating protocol and platform.Digium will give you the chance to play with their latest SIP phones as well as see demos about the new cool Asterisk features. A consistent team from Sipwise will be around to reveal all the bits of SIP:Provider platform.Special thanks to all sponsors that allowed us to bring again an amazing group of speakers: FhG Fokus, Asipto, Sipwise, Sipgate, Simwood, Evariste Systems, Matrix.org, Digium, Core Network Dynamics, Voicetel, DIDx and Pascom.See you next with in Berlin! Anyone willing to help can start exporting functions from modules to embedded interface or test some more complex configs in Lua or Python.Thank you for flying Kamailio and looking forward to meeting many of you at Kamailio World Conference in less than two weeks! The module will be part of the future major release Kamailio v5.0.0! While waiting for that release you can play with NSQ using the git master branch.Thank you for flying Kamailio! The kamailio.org website has been updated to use a responsive theme. The old skin was built during 2010-2011, the corresponding wordpress theme was not updated for few years, lacking the responsive layout.The new look keeps the same clean and clear approach. One of the major changes was the need to widget-ize the sidebar on the right, which used to be the main navigation menu for most of the resources provided by Kamailio project. Several of them were left on the new right sidebar and the rest along with new resources were indexed by the menus at the bottom of the pages.The main page for kamailio.org is planned to be reorganized with a fresh design in the near future as well, building on top of the framework provided by the new wordpress template.Suggestions on how to organize the website and its menus for better accessibility or more suggestive navigation are very welcome! 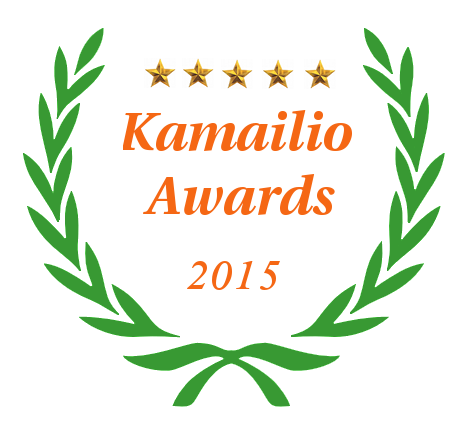 Email us to .Thank you for flying Kamailio! Don’t forget that this year Kamailio celebrates 15 years of development, the party is at Kamailio World!We expect to fill the capacity of the conference room, if you haven’t registered yet and plan to attend, do it as soon as possible to secure your seat!Many thanks to our sponsors that made possible this event: FhG Fokus, Asipto, Sipwise, Matrix.org, Sipgate, Simwood, NG Voice, Digium, VoiceTel, Evariste Systems, Core Network Dynamics, Pascom, Didx.net.Thank you for flying Kamailio and looking forward to meeting many of you at Kamailio World 2016! Among announced participants: Alex Balashov, Daniel-Constantin Mierla, Fred Posner, Olle E. Johansson, Victor Seva.If have something to discuss, do not hesitate to add your topics and list your name in the page. Anyone can participate, even only for watching the discussions. Kamailio has one of the best and scalable TLS implementations, with asynchronous support since 2008, already deployed by large IM mobile services servicing millions of active users. If you don’t have TLS enabled in your Kamailio, it’s time to act, it costs nothing now and brings full privacy to your customers connecting over the public internet!Of course, kamailio.org website is already using a Let’s Encrypt certificate.Thank you for flying Kamailio! And looking forward to meet some of you at Kamailio World Conference 2016! The release series 4.4.x is expected to be the last starting with number 4, next major release is planned to be 5.0.0, which should get Kamailio to a new era — there are already ongoing discussions on users mailing list about the changes to be done as well as a wiki page was created to collect the relevant ideas for 5.0.x. 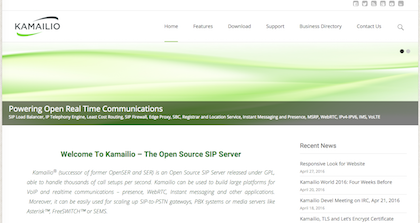 Join us to design and develop v5.0.0!Enjoy SIP routing in a secure, flexible and easier way with Kamailio v4.4.0!Thank you for flying Kamailio and looking forward to meeting you at Kamailio World Conference 2016!